Ever since John Wagner showed the first stirrings of the Democracy movement in Judge Dredd way back in stories like America and Letter From A Democrat, the possibility of the Judges being the bad guys has been up for debate. Insurrection comes down hard on that idea, putting the Justice Department firmly in the role of flat-out villains. Here, the Judges are monsters, an implacable enemy who can’t be reasoned with, one who will stop at nothing to quash any threat to their fascist regime. This third and final chapter closes the story of a rebellion on a distant colony of Mega-City One, a planet who after repelling an alien invasion with no support from Earth decide to go it alone and declare independence. 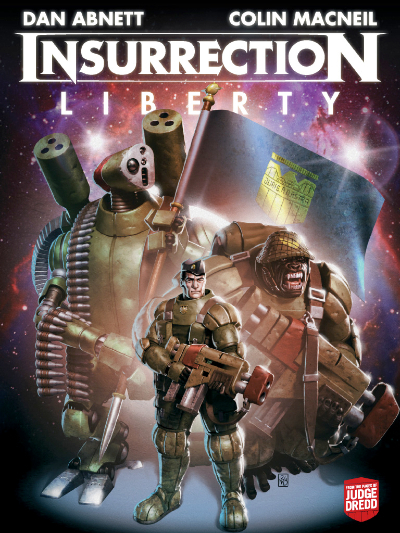 As the insurrection takes root in other planets, Colonial Marshall Karel Luther leads an army of humans, mutants, droids and uplifts (genetically-enhanced Simians) in a war of principle against the overlords from the Big Meg. On the surface a high-action war comic set in an undefined amount of years after Dredd’s time, Insurrection is a powerful examination of big concepts like liberty, honour and oppression, told on a massive scale but shot through with enough smart characterisation that shows the very human cost of the decisions made in wartime and the effect they have. There’s nobody better qualified to tell a tale like this than Dan Abnett. A veteran of over 40 novels in the Warhammer 40,000 universe, Abnett knows exactly how to depict the horrors of future war, layering his script with visceral scenes of carnage that almost literally explode from the page thanks to Colin MacNeil’s typically eye-popping artwork. MacNeil is the perfect choice for a story like this too, creating a grim future war that feels all too real, with his lush black and white pages pulling you into the conflict. Bones crack, armour shatters and skulls explode with brutal regularity here and MacNeil ensures you can feel the impact of every bullet. For all the ultra-violence, it’s emotion that is at the heart of the story. Luther’s empathy for the droid and Uplift cause is held up in stark contrast against the cold detachment of the SJS, who come off more robotic than any machine on the side of the rebellion. There’s no moral ambiguity here, though. Abnett’s Justice Department are monsters, but it’s that clear definition that gives Insurrection it’s bite, resulting in one of the best stories 2000 AD has published in a long time.